Hello and welcome to Hoolabalu. 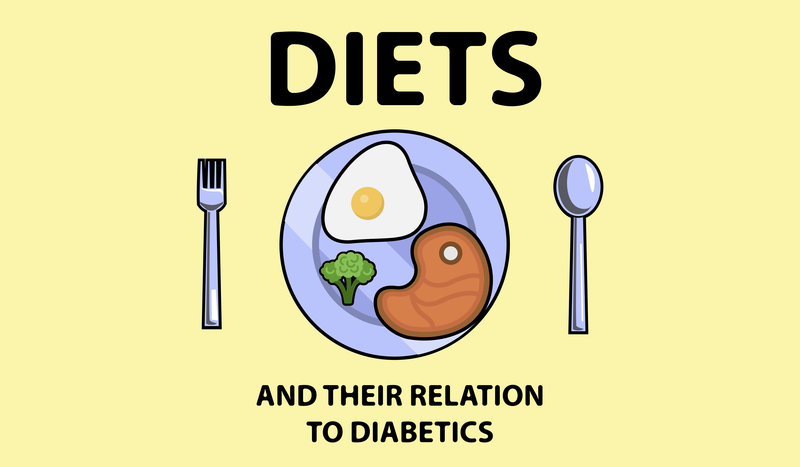 In this video we will be taking a look at different diets and their relation to diabetes. The body’s insulin resistance or the inability to produce insulin is what causes blood glucose levels to remain elevated in diabetics. That means your choice is between decreasing blood glucose levels by increasing insulin through medication or limiting the consumption of sugar. Many diabetics try to control their blood sugar levels naturally through diet and exercise. There are many different diets that are aimed towards helping diabetics, here are a few examples. This diet limits carbs to very small amounts, replacing it with more proteins and fats. Eating such small amounts of carbohydrates leads to a lack of glucose circulating in the body, hence your body needs to find an alternative source of energy. The body enters a state of ketosis where the liver then converts fatty acids into ketone bodies, this is known as ketogenesis. Cells can then use ketone bodies for energy. There is still debate on whether the keto diet has any metabolic advantage in losing weight. You will likely loose weight, but whether this is from decreased calories or from ketosis itself is still up for debate. However, restricting the consumption of carbohydrates through this diet has been shown to significantly reduce diabetic symptoms and increase insulin sensitivity. Still, it may be risky to try this on your own as low levels of blood sugar can also be detrimental to your health. Diabetics who are on insulin medication and don’t account for the sudden decrease in sugar consumption can experience hypoglycaemia – basically low blood sugar. Additionally, there is a risk of developing diabetic ketoacidosis, a risk greater in type 1 diabetics. Therefore, it is a good idea to consult and discuss this option with your doctor before attempting it. Plant-based diets are also often recommended to diabetics. Observational studies, as stated by a research paper in May 2017, strongly supports the benefits of plant based diets in diabetics. It suggests that the source of macronutrients may be more important than the ratio. For example, it is better to eat plant based proteins rather than animal proteins. The paper also cites a large study that found plant-based diets reduced the risk of developing diabetes by 34%. The benefits of plant based diets stem from the whole and unprocessed characteristics of the foods, which spread out the absorption of sugar over a longer period of time. These foods also contain lots of fibre, antioxidants and magnesium which are known to increase insulin sensitivity. Fibre can also help diabetics lose weight as it generally means the food will have less sugar and be more satisfying.. The study also emphasizes the health benefits of this diet that extends beyond reducing insulin resistance, including reduced risk of heart diseases and different type of cancers. One of the more extreme diets is the very low calorie diet or VLCD. This is where a person only consumes around 800 to 500 calories a day. It often replaces meals with shakes which promotes quick weight loss but comes with harsh health risks. If at all used, it should be discussed with a health care provider and done for only a short time. There are many side effects such as nausea, fatigue, or diarrhoea. Additionally, these shake diets don’t teach people healthy eating habits which will help diabetics in the long run. If you are diabetic or pre-diabetic you may not have to make such drastic changes to your diet. Being aware of what types of foods are beneficial or detrimental to your health can help you make small changes. One of the ways to determine which carbs to eat is to look at its glycemic index score, the lower the glycemic index score the slower the food will absorbed into your bloodstream. We made a video on this topic which you can go watch on our channel. Diabetics should also avoid eating fried foods or foods high in saturated fats. Additionally, Salty foods that are high in sodium can increase blood pressure, which can exacerbate the stress already placed on your cardiovascular system. With so much information, so many different diets and often contradicting research, it’s difficult to figure out which diet to follow. Nevertheless it is vital to understand that what works for one person may not necessarily work for another. Try to make small dietary changes in your life such as only eating plant based proteins or whole grain carbohydrates. Then see how it affects your body, your overall feeling and your blood glucose levels. It may be as simple as cutting back on soda and junk food but often overeating is rooted in social, emotional or habitual reasons rather than hunger. Consider seeking psychiatric help if that is the case. These changes will accumulate in the long run, not only changing your diet but turning into permanent lifestyle patterns. Thank you for watching Hoolabalu. If you’ve liked this video, please subscribe to our youtube channel, check out our other videos and like us on facebook too!